Getting your child to start brushing can sometimes be very difficult. They don’t like the toothpaste for toothbrush you got them, they can’t stand the bristles against their teeth, or they jump into a tantrum as soon as you tell them it’s time to brush. Regardless, maintaining their oral health is incredibly important at a young age, so your pediatric dentist in Birmingham is here to help. In her experience, electric toothbrushes can make brushing easier and even more fun. Just like their manual counterparts, electric toothbrushes are being catered to children with their favorite characters and colors to choose from. Here are a few tips to help you find the most effective brush for your child, regardless of their age. While electric toothbrushes can make your child’s routine easier, it’s important to acknowledge the appropriate time to start. If your child is between four months and two years of age, you’ll need to start out with a baby manual brush specifically designed with extra-soft bristles. The last thing you want to do is irritate their sensitive mouths. From ages two to four, you can upgrade to a larger brush that they can start holding on their own. However, they still need to practice their technique before getting an electric brush. Supervise them as they brush and help them brush if necessary, so they get used to the proper technique. You’ll still want to supervise them while they use an electric toothbrush at first. Some toothbrushes may vibrate too much, creating an uncomfortable experience, so make sure to ask what they think about their brush. 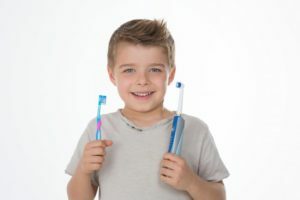 Once your child gets between the ages of 8 and 12, they should be brushing regularly on their own. Just like teaching your child to ride a bike, you want to make sure they’re having fun but also being as safe as possible. In the early stages of learning to brush, you’ll want to take the proper precautions. This means until the ages of three, they should only be using a smear of toothpaste no larger than a grain of rice. From ages 3 and up, they should only be using about a pea-sized amount of toothpaste. Doing this reduces the amount of toothpaste accidentally swallowed, preventing any harm during their early oral developments. An electric toothbrush can make your child’s brushing experience more fun and effective than ever before. If you want more tips, schedule an appointment with your pediatric dentist in Birmingham today! Dr. Angelica R. Rohner earned her undergraduate degree in early childhood development and education and her D.M.D. from the University of Mississippi School of Dentistry. 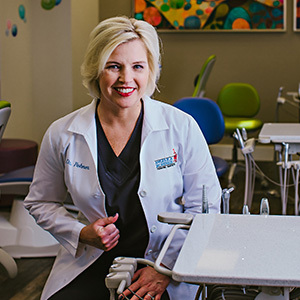 She is board-certified in Pediatric Dentistry and is a diplomate of the American Board of the American Board of Pediatric Dentistry. To learn more tips for buying an electric toothbrush and learn about her practice, contact her at (205)870-0892 or visit her website.